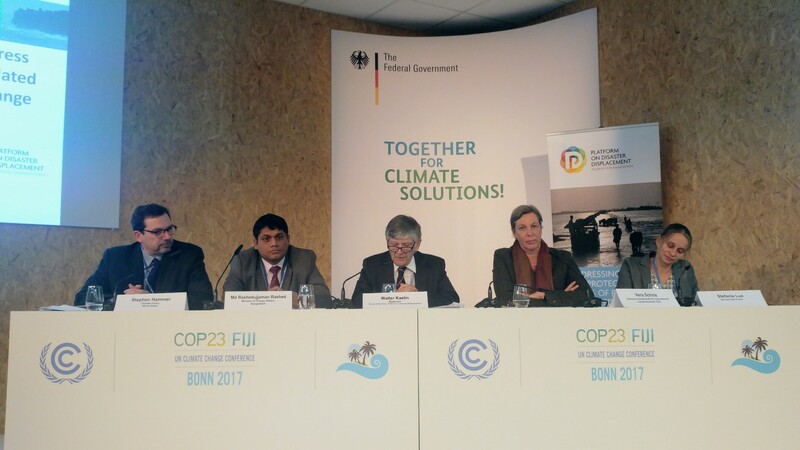 Bonn, 7 November 2017 – While the Climate Change Conference kicked off in Bonn with strong calls to meet goals set out in Paris, government representatives from Bangladesh and Germany, experts from the World Bank, the GIZ and the German Red Cross stressed the need to become more proactive risk managers and adopt comprehensive approaches to better protect vulnerable children, women and men on the move in the context of the adverse effects of climate change. Organized by the German Federal Office (FFO), the German Ministry for Economic Cooperation and Development (BMZ) and the Platform on Disaster Displacement (PDD), the event sought to highlight how different approaches supported by the Government of Germany complement each other in addressing and managing climate and disaster risks, including disaster displacement. During the opening, Germany (FFO and BMZ) highlighted its continuous commitment to support such approaches and aptly reflected it in their motto at the German Pavilion at COP23, Together for Climate Solutions. Germany currently acts as Chair of the PDD until the end of 2017 when Bangladesh takes over as of January 2018. Speaking on the panel, the representative of the Bangladesh Ministry of Foreign Affairs emphasised the importance of national and regional approaches to address climate-induced mobility. 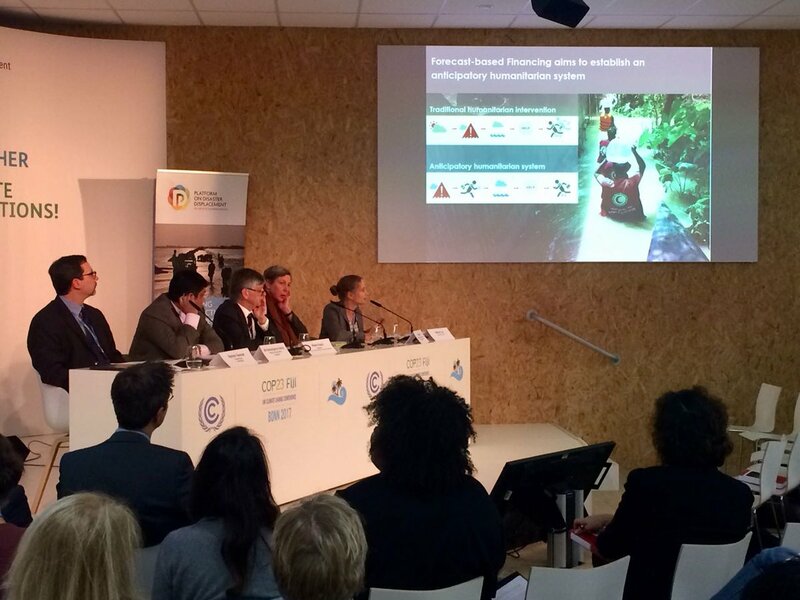 The World Bank’s Climate Policy Division presented their upcoming report on trends and migration scenarios. The report will highlight that unless climate change mitigation (e.g. reduce greenhouse gas emission) and adaptation efforts are scaled up, the world will see a significant increase in human mobility within the next couple of decades. 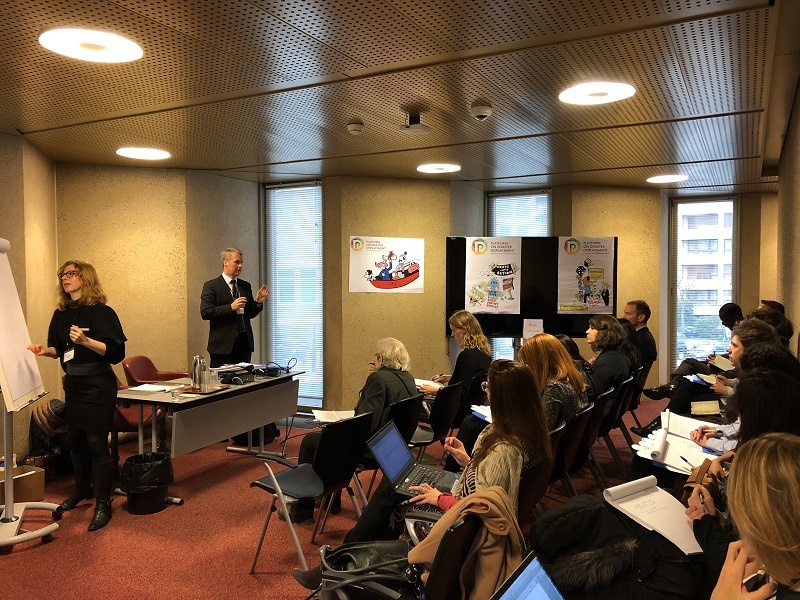 The German Red Cross stressed the need for efficiency and effectiveness by the humanitarian system and highlighted Forecast-based financing – humanitarian funding based on forecast information for pre-agreed early actions that aim at reducing the humanitarian impact of a disaster. The German Red Cross also used the opportunity to launch a book titled the Routledge Companion to Media and Humanitarian Action. 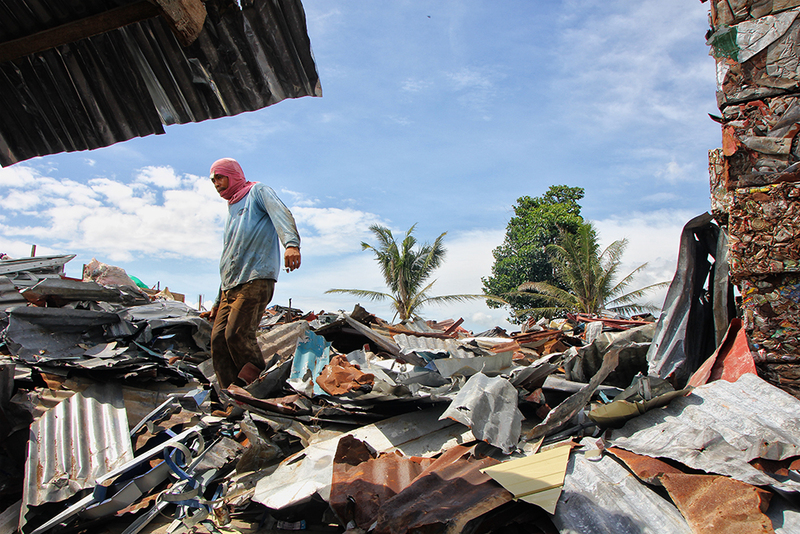 The Deutsche Gesellschaft für Internationale Zusammenarbeit (GIZ) underlined the use of integrated risk management, insurance and dealing with disaster displacement as some of the possible comprehensive approaches, citing InsuResilience as an example. Discussions concluded that people will continue to move, or be forced to move, in areas affected by the adverse effect of climate change. Panellists emphasized that addressing disaster displacement should be reflected both in the Global Compact on Migration and in climate change negotiations, for example, in the deliberations of the Task Force on Displacement under the Warsaw Mechanism for Loss and Damage. Discussions also highlighted the need to strengthen knowledge and evidence regarding human mobility in climate change contexts. This side event was one of many events at the Climate Change Conference focusing on the topic of climate change and human mobility, other side events are listed here. The Platform on Disaster Displacement works towards better protection for people displaced across borders in the context of disasters and climate change. For more information, please contact: Chirine El-Labbane, PDD Communication Officer, [email protected].